Landing on the docks at Villa Balbianello was like stepping into a fairytale. This 18th century Italian villa built on a promontory on Lake Como with its carefully cured garden is the ideal luxury destination wedding venue. 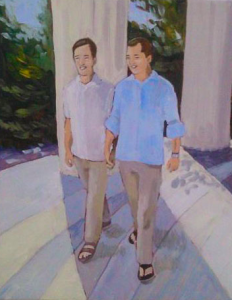 I was there to captrue a young American couple’s afternoon ceremony and I couldn’t have been happier to paint here. Gemma and her team from My Lake Como Wedding made sure all the details where in place: florals, aperitifs, table settings and caterers ensuring the couple’s day was truly unforgettable. 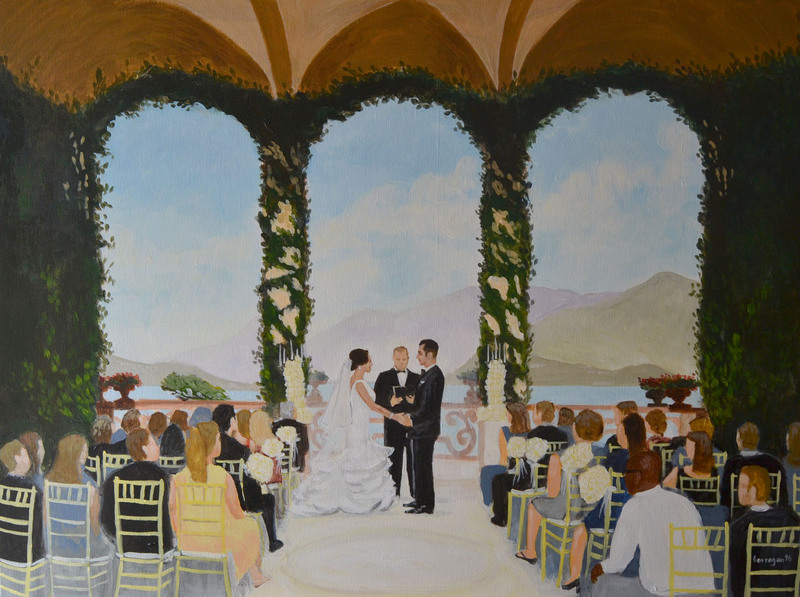 They chose the Loggia for their ceremony with its ivy covered arches and breathtaking view of the lake. I arrived about 3 hours before to set up, sketch the scene and paint the afternoon glow and would continue through the evening. 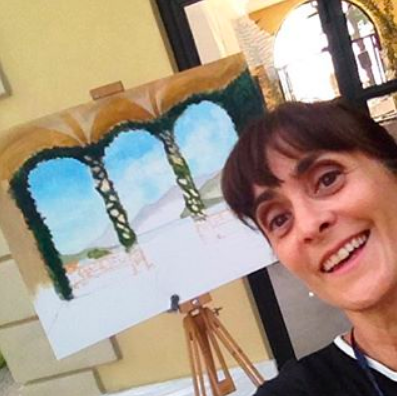 One of the things that I enjoyed about painting in such a festive moment was being able to talk with the guests and family members, answering questions about the painting and chit chatting about Italy. Most of the painting was done that evening and the final touches were painted in the studio in the following weeks. Looking forward to my next Lake Como wedding! Walking into the Teatro Sociale in Amelia, Umbria is like walking into a box of fine chocolates, you know, the kind that are decorated all sweet and lovely. It’s a recently restored theatre built in 1783 by the architect Stefano Cansacchi and exquisitely decorated. I was there to kick off Opera Extravaganza’s first event of 2016: Vivaldi’s Four Seasons and the Opera Buffa, La Dirindina. Opera Extravaganza is an incredibly talented cultural organization located iin Vetralla, Lazio Italy and headed by Susanna Ohtonen and Rudolph Hupperts. They dedicated themselves to organizing high level operas, concerts and courses. They’ve put together a wonderfully innovative project called “Adopt a Theatre”. Basically anyone in the world can sign up to adopt a theatre and by doing so can view via live streaming the productions that Opera Extravaganza organises during the year. Just think, you can watch a live opera production in the comfort of your own home wherever that may be. I arrived at the theatre about 3 hours before the start of the concert in order to set up and start painting the background. 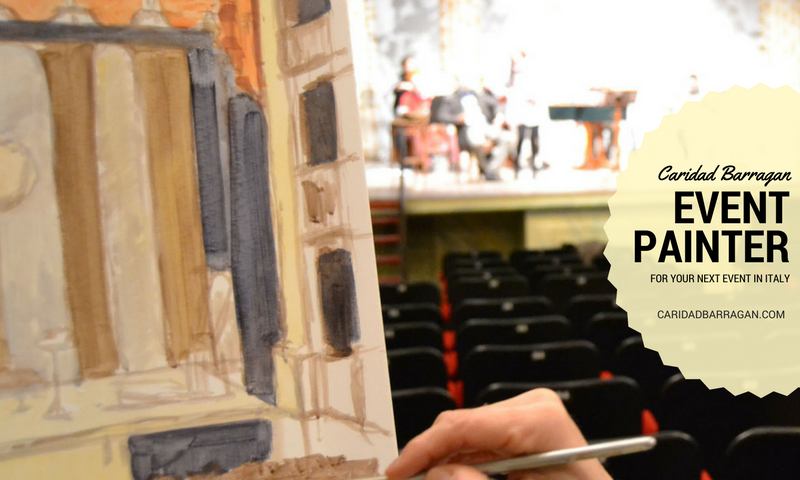 What a treat to paint during the rehearsal, listening to Vivaldi. I knew I wouldn’t have a lot of time to paint during the Dirindina since it would only last about 40 minutes. I had to get as much painting down as possible beforehand. The rest would have to be done from photograph later in my studio. Having spoken with Susanna about the painting, she explained to me that she wanted me to capture the joy and playfulness of the Dirindina with her big wig and heavy stage makeup. And this is exactly what I did! 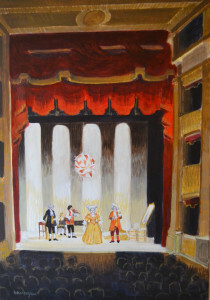 It was very important to paint the warmth and glow of the theatre lights that illuminate the theatre and also paint small details of the actors on stage. I can’t wait to Live Paint my next venue! Are you planning an event such as a wedding, anniversary, bar mitzvah or corporate in event in Italy or Europe. 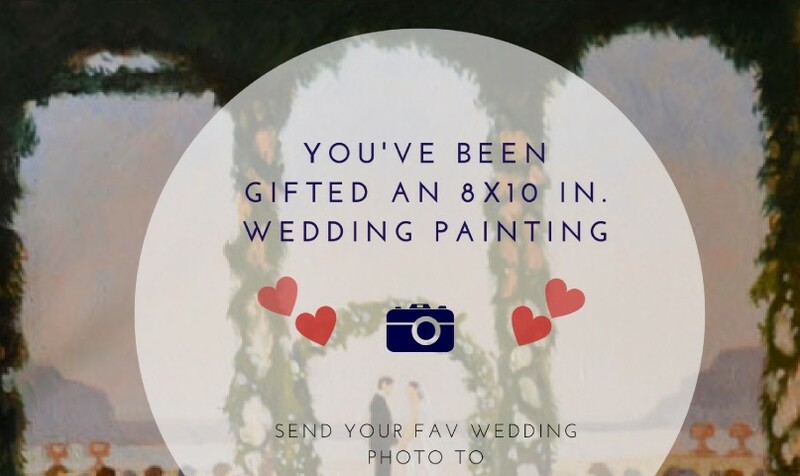 Contact me below, I’d love to paint your celebration. You’ve just set your wedding date in Italy, Europe or maybe the UK and you’re starting to organise and think about the many details it’s going to involve: flowers, favours, your color theme, entertainment, catering, you know what I mean. 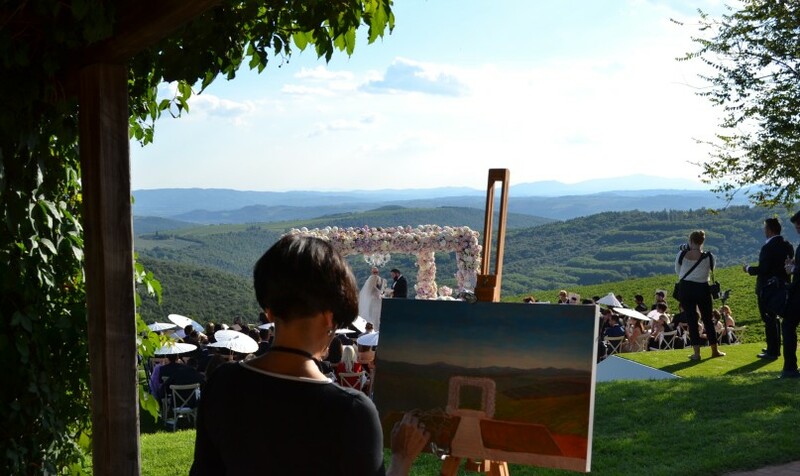 Whether you’re a recently engaged couple or an experienced wedding planner specialised in destination weddings, how do you go about choosing the right Live Wedding Painter for your special day? Visit their website. Is it neat, organized? Does it have personality and a style of its own? Does it look happy? Does it communicate serenity? Does the painter look friendly and natural? 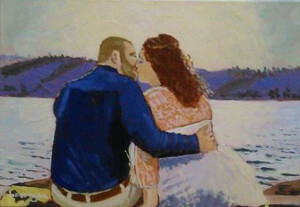 Have a look at their gallery of paintings and ask yourself, Is this a style that I like? Would I want their work hanging in my home? Is it cheerful and fresh? Have they got an online shop? What does their feedback say about them as a person. Are they “super easy to work with” and is their customer satisfaction rating 5 stars? Where are they located? Will they travel to my venue? If you’re having a international destination wedding it may be a plus to have an Live Painter that speaks different languages and be able to communicate and interact with your guests. Contact them with any of your questions and notice the tone they answer you in. Do they answer you right away? Are they courteous. Ask them for references and or images of other live painting events they have painted. Once you’ve decided which one is the best for you, you’ll want to ask them for their pricing. But beware of low pricing! 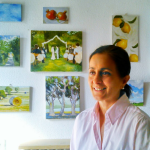 Event painting is lots of fun for your guests but it is a skill that takes professional training and thousands of hours to hone. 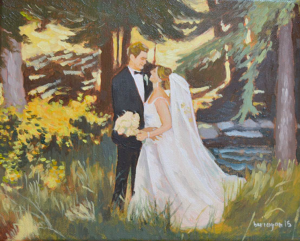 A professional Live Wedding Painter arrives 3-4 hours prior to the start of your event in order to set up and start sketching and painting the background of your painting. 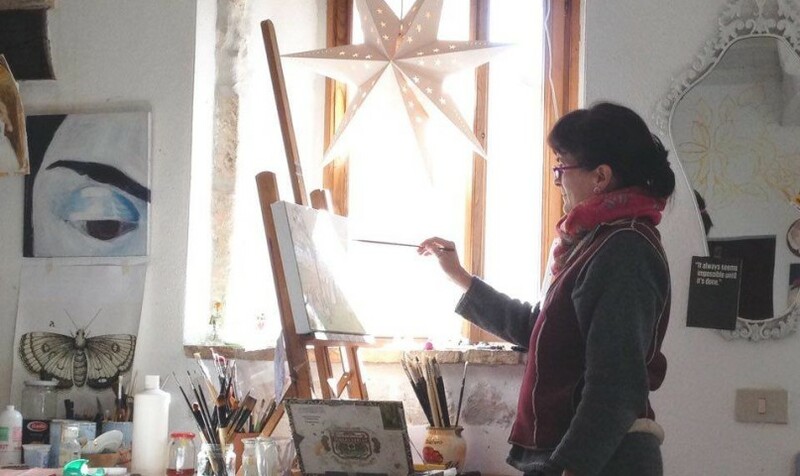 He or she will continue painting for another 4-5 hours and will eventually complete your painting in the studio the following weeks adding precious details and finishing touches. 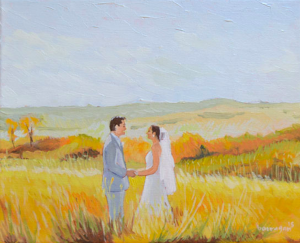 In the end you’ll have a one of a kind work of art that captures your special day on canvas. 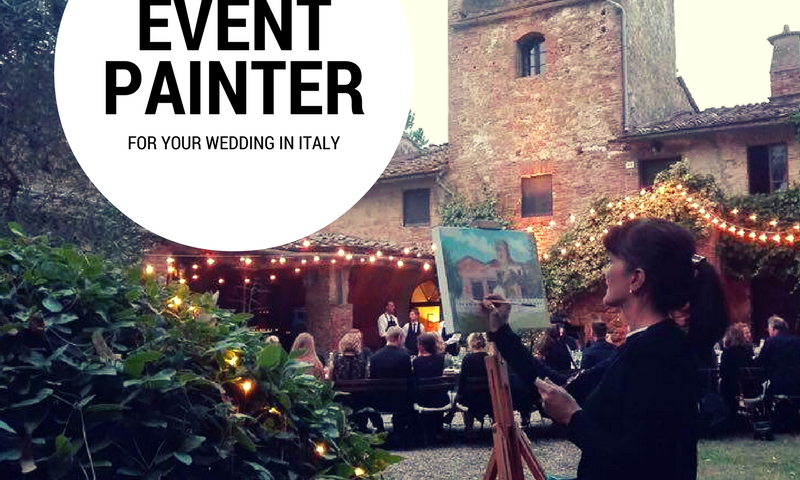 If you have a personal experience hiring a Live Wedding Painter in Italy, Europe or the UK please share it with me in the comments below.